Capture high-definition images and videos with your HoverCam using the Flex10 software. 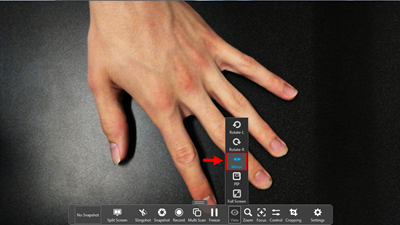 The Flex10 software also provides a variety of different editing tools that can be used to vastly enhance one's experience with the device, as well as facilitate learning in a classroom setting. To use the software, the Hovercam must be connected via USB. To switch from HDMI to USB, click the monitor icon in the upper left corner on the device and choose USB. 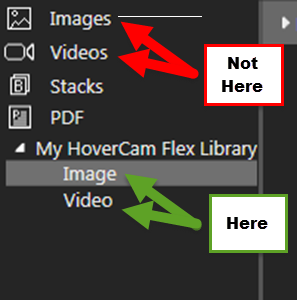 Use the camera settings in the Flex10 software to adjust how the HoverCam picks up an image or video. ViewUse the View button to change the orientation of the HoverCam's camera. Click the Rotate-L or the Rotate-R buttons to rotate the camera's image to the left or right respectively. Click the Mirror button to reflect the image orientation. Note: The Mirror option will not be available for every single viewing orientation, only certain ones. 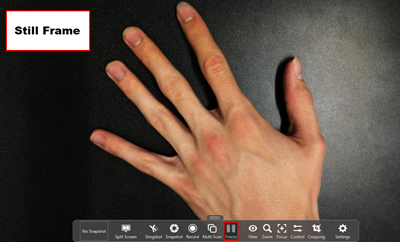 Click the PIP button to access a secondary camera (if you have a secondary camera set up). Click the Full Screen button to toggle full-screen mode. ZoomUse the Zoom button to adjust the magnification of your HoverCam's camera. Use the indicated slider bar to zoom in and out. 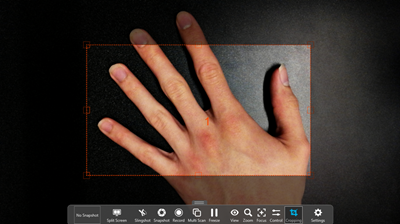 You can also adjust the borders of the indicated Pan box to adjust the zoom of your image. FocusAdjust the focus of your HoverCam's camera with the Focus button. Click the AF button to auto-focus the entire image. 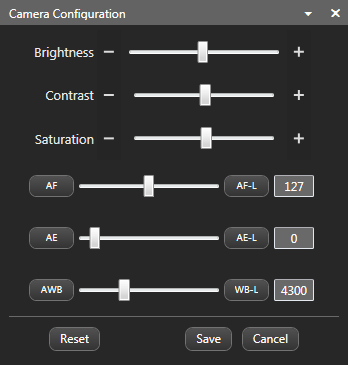 Click the AF-L button to lock the focus at the level it's currently at. 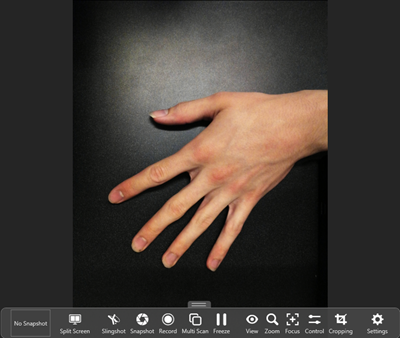 Use the Selective tool to focus certain parts of the image. ControlUse the Control button to adjust the camera configuration of your HoverCam. Change settings such as brightness, contrast, and saturation by adjusting the horizontal sliders. 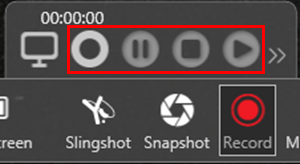 Click Save when you're finished adjusting the image settings. CroppingUse the Cropping button to focus on a particular section of the HoverCam's capture. Step 1:Click the Cropping button. Step 2:Click and drag to select the portion of the screen that you wish to capture. 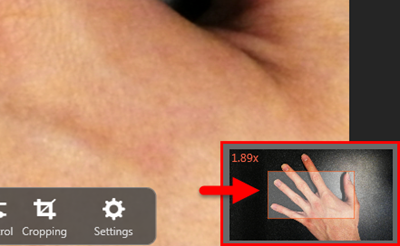 Step 3:Click any of the indicated boxes along the border of your cropped image to change the size of your capture. You can also click and drag the cropped image. 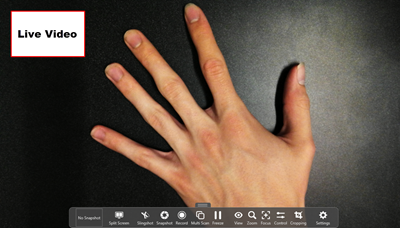 Now that you've cropped out a particular portion of your screen, if you click Snapshot or Record, the HoverCam will only focus on the part of the screen that's been cropped out.Note: If you hold [Ctrl] and click and drag again, you can add a second cropping frame. Once you've created two frames, if you click either Snapshot or Record, the HoverCam will capture both frames. Capture snapshots and record videos with the Snapshot and Record buttons. Position whatever you're taking a picture of under your camera, and press Snapshot. 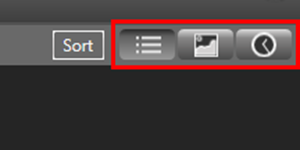 View your snapshots by double-clicking the indicated thumbnail and going to the Archive Manager. Click here to learn more about archiving files. Position what you're recording under your camera, and press Record. Record, Pause, Stop, and Play your video by clicking the indicated buttons. Press the arrows to the right of the Play button to view the Timer options. Use the timer to set a maximum length for your recording. To view your video, double-click the indicated thumbnail. Note: You cannot directly view your videos in the Flex10 software. 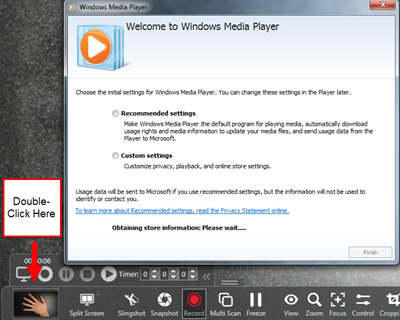 You'll have to open a separate program, such as Windows Media Player, to replay your videos. 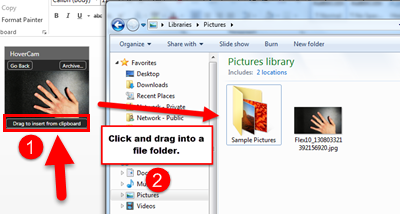 Double-clicking the thumbnail will automatically prompt you to launch a program such as Windows Media Player. To see a list of your recent snapshots and video recordings, click on the indicated tab on the left-hand side of your screen. 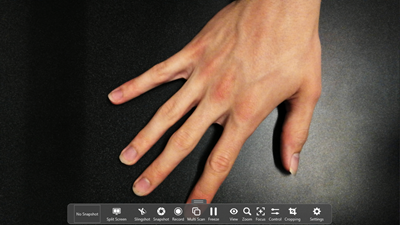 The Flex10 software contains a variety of different tools that are only accessible via the computer software and not on the HoverCam itself. 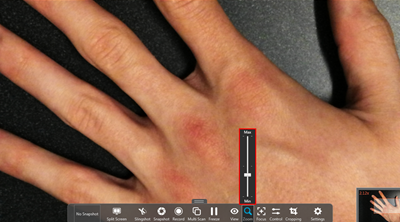 Some of these tools include Split Screen, Slingshot, Multi Scan, Freeze, and Annotate. Split ScreenUse the Split Screen feature of the Flex10 software to capture two different scenes at once. When you click Split Screen, Flex10 will allow you to take a snapshot and view that snapshot while you're still watching the live video of whatever is under your HoverCam's camera. The snapshot will appear on the left screen, while the live video will appear on the right screen. 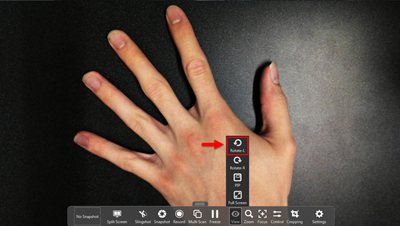 Use the Still Image Controls to adjust the zoom of your snapshot. 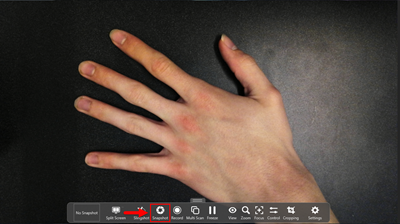 Clicking the Snapshot button again will change the snapshot on the left screen, while maintaining the live video capture on the right screen. SlingshotFlex10's Slingshot tool allows you to drag a snapshot from your HoverCam to another program, such as Microsoft Word. 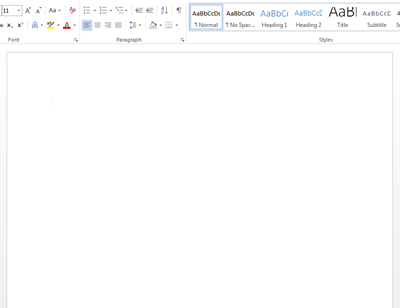 Step 1:Open any kind of image editor or word processor program such as Microsoft Word. 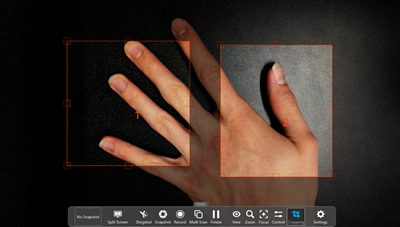 Step 2:In the Flex10 software, click Slingshot. 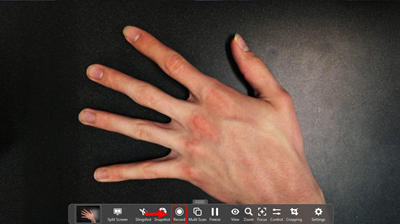 A. Click on the thumbnail and drag a direct snapshot from the live video onto the outside program. B. Select a snapshot to use from your archive by clicking Archive, and clicking and dragging a photo from your archive. 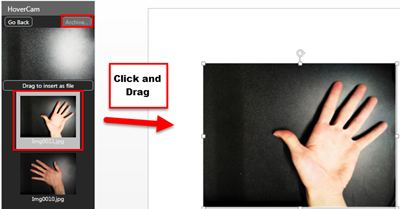 C. Click Drag to insert as file, and then click the thumbnail (or an image from your archive) to drag a snapshot and insert it as a file into a folder. Step 4:Click Go Back to return to Flex10. 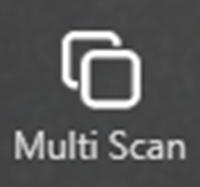 Multi ScanUse the Multi Scan feature to set the HoverCam to automatically take pictures at specific time intervals. Step 2:Set the time interval. This is how often the HoverCam takes a snapshot. 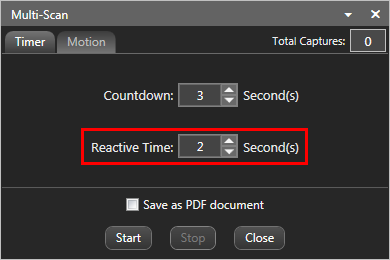 For example, if you want to take a snapshot every 3 seconds, set the time interval to 3. 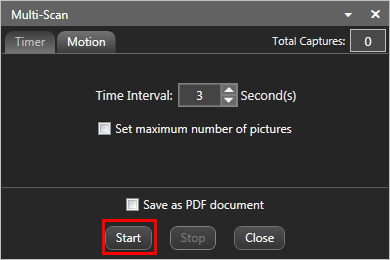 (Optional) Step 3:Select Set maximum number of pictures if you want the HoverCam to stop taking pictures after a certain amount. 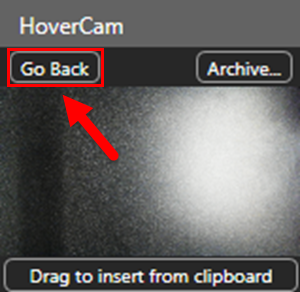 You can also set the HoverCam to take a picture after it detects a movement by clicking the Motion tab. Countdown is the amount of time the HoverCam waits to take a picture after it detects a movement. 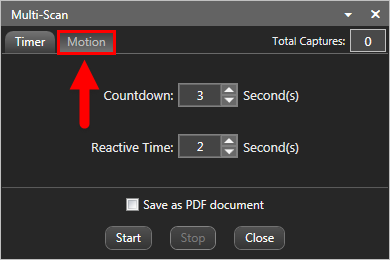 Reactive Time is the amount of time that the HoverCam will wait before detecting another motion. FreezeThe Freeze tool allows you to pause whatever is under the HoverCam Camera, without taking a snapshot. 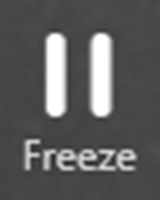 Click the Freeze button to pause whatever is on your screen. Click it again to resume the live video. 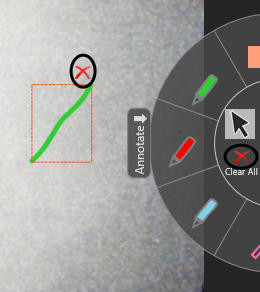 AnnotateThe Annotate tool allows you to draw shapes and lines right on your screen. 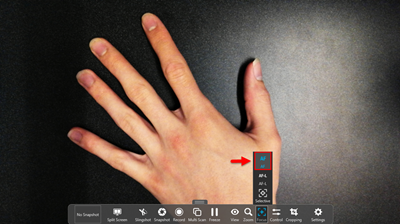 Click the tab on the right-hand side of your screen to access the annotation tools. 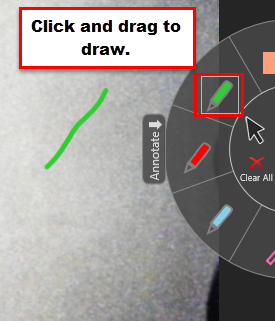 Select a color, and then click and drag anywhere on your screen to draw a line or a shape. Click the dots above the pens to change the color and thickness of your pen. You can also choose to draw a different shape. 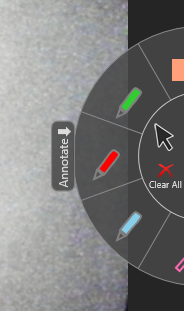 Click the indicated X on a shape to delete the shape, or press the X above Clear All to clear all annotations. Navigating the Archive ManagerView and organize snapshots and videos with the Archive Manager. To access the Archive Manager, click the tab on the left-hand side of your screen, and then select Go to Archive. 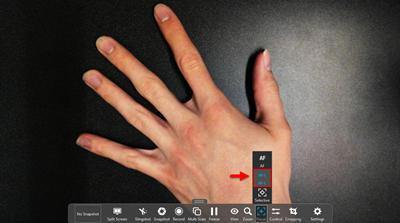 Choose to view Images, Videos, Stacks, or PDFs with the indicated buttons in the left-hand margin. 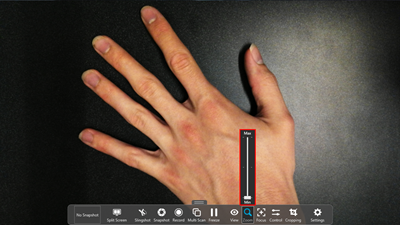 The display options are located on the right-hand side of the screen. 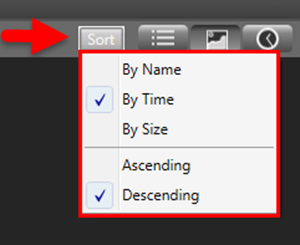 Click the Sort button to choose how the list of files should be organized. 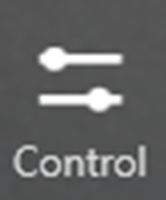 These three buttons will display the files in List View, Image View, or Timeline View. Archive ControlsLocated on the top of the screen is the toolbar that contains the archive controls. 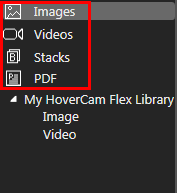 Note: If you would like to edit, save, share, or print any of your files, you must be in the Images or Videos section that lies under My HoverCam Flex Library. To stack a group of images together, select the images you would like to use, and click Stack. 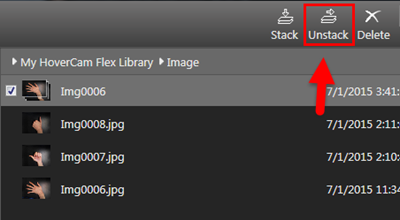 Stacking allows the images to be grouped together into one folder. This makes it easier to share or send a group of files all at once. The name of the stack will be the name of the first file in the stack. To unstack a group of files, simply select the stack, and click Unstack. This will separate the files. Delete a file by selecting the file and clicking Delete. 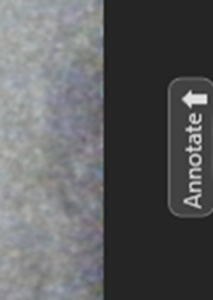 Use these buttons to Create PDF or OCR files of your images. Click the Export button to export and save an image or video. Use the Email button to send your files to another person. 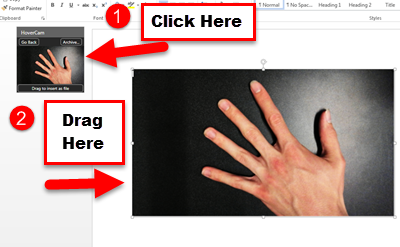 Use the Print button to print your images. For further assistance, please refer to this help guide. VideoFor more information on using Flex10 Software, visit this Youtube video.